Ogden Nash's "Candy is..."and Dorothy Parker's "Men seldom make passes..." are occasionaly attributed to the other in error. Perhaps the confusion is understandable given the many similarities between the Gotham based purveyors of witty and provocative verse. As luminaries in the Manhattan literary world their lives would often intertwine. In one unlikely episode the junior Nash served as the editor of the eminent Ms. Parker's work at the New Yorker for a brief spell in 1931. Although Nash's most urgent mission was often trying to find Parker in New York's speakeasies and entering an 11th hour plea to complete her column before Friday's deadline. Parker was known to have a rapier wit which she often used to shred sub-par works. However, Parker may have espied something of herself in Nash's early work. 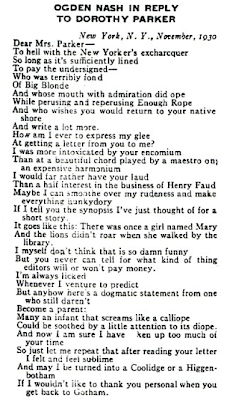 In what would be the first of many written and personal exchanges between the two, Parker sent him a rhyme of praise in the fall of 1930. Lamenting that while she used to 'dabble for a living in rhyme', she had since become derailed as a poet by "Racquet club members, players on two pianos, raconteurs and homosectuals." She wished Nash success in life and literature and wanted him to know that she was a "respectful admirer." In Nash's reply you can sense the joy and awe he must have felt shortly after he opened the envelope with the Swiss postmark. While the twenty eight year old Nash's star was beginning to rise, as his poems were being published with increasing frequency, receiving a personal note from a member of the Algonquin roundtable was a whole other level of recognition. Nash responded with an enthusiastic poem of his own. He later shared the exchange with his editor. The correspondence, dispensed from Simon & Shuster's 'Inner Sanctum' appeared in newspaper ads promoting the debut of Hard Lines, Nash's first collection. 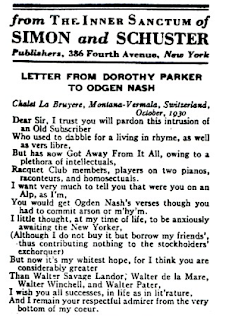 While Parker's letter to Nash has been published several times, I did not know of Nash's reply until Kevin Fitzgerald, President of the Dorothy Parker Society recently shared it with me. Than half interest in the business of Henry Faud"
Nash's speaking voice reflected his upbringing in 'society'. is phonetic treatment of lord and Ford as 'laud' and 'Faud', was probably close to Nash's actual pronunciation. 'Big Blonde' refers to Parker's highly acclaimed short story of 1929. The Dorothy Parker Society stages Parkerfest every spring: A spirited celebration of the author's life and works. Can you help me reach the holders of Nash's copyrights. I need to obtain permission to use one of his poems in a book. I also would like to reach the holders of the copyright. I have made illustrations to accompany a poem and would like to publish that. My email is Harleyqueenofdiamonds at gmail dot com. @benedict, since this comment is 6 years after yours, please let me know if anyone ever contacted you.